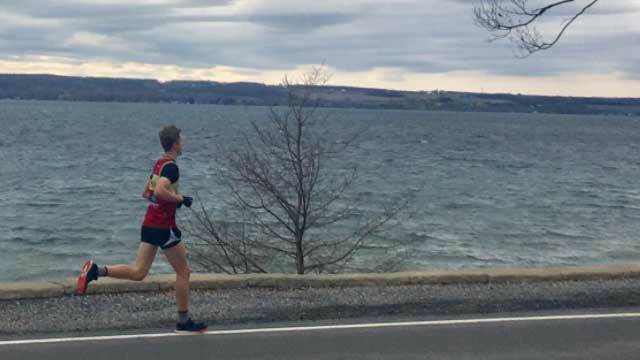 The eighth-annual Seneca7, a 77.7-mile relay race, consisting of 348 seven-member teams running the circumference of Seneca Lake, was held Sunday, April 29. The event began in downtown Geneva, with runners heading south along the west side of Seneca Lake, through Yates County, Schuyler County including Watkins Glen, and Seneca County, before returning to Geneva for a finish line celebration extravaganza. Awards were three-deep in several categories: all male, all female, and mixed. 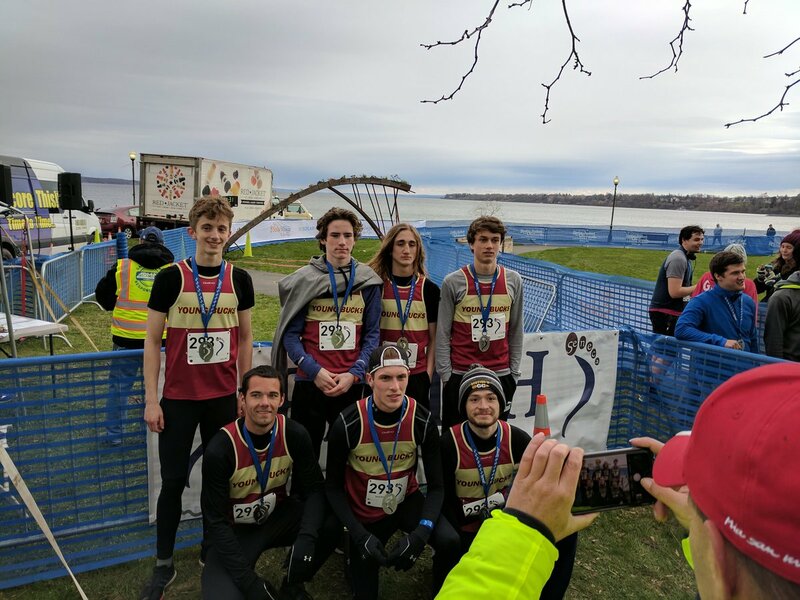 In the all male category, The Young Bucks, from Geneva (pictured below), rounded out the top three, with a time of 8:27:24. We’re Older Than You, from Ithaca, came in second, coming in at 8:04:29. Liar, Liar, Feet on Fire, from Johnson City, took first place with 7:55:42, up from second place last year. In the all female category third place was awarded to Upstate Birds, out of Buffalo, who finished with a time of 9:28:22. Second place was awarded to Grab ’em By The Laces, from Binghamton, finishing in 8:45:33. Ithaca’s Red Newt Racingwere the champions – both in the all female and overall – clocking 7:54:28. The mixed category, consisting of men and women, saw Jerry and the Atricsfrom Williamsville take third place, finishing in 8:42:13. Disqualify This III, out of Geneseo, was not disqualified, finishing at 8:41:09 for a respectable second place. And in first, Montrose PA’s Renegade 7, coming in at 8:06:30. The bike category was comprised of teams who, instead of being supported by an official race vehicle (van or bus), were 100% self-supported – each team member rode a bicycle for the duration of the race. Bike teams have their own special category for awards, and this year first place in this category went to Juju Pepe and the Exploding Heart, from Canandaigua, who finished with a time of 9:03:42. Race co-director Jeff Henderson notes that the race wouldn’t be possible without the support of the community. Henderson says that local businesses along the course are also instrumental to the race’s operation, noting that a number of wineries and other regional businesses allow the race to use their property for exchange points – the place where racers hand off the slap bracelet to each other – and volunteers from local not-for-profits volunteer to man these stations. Many athletes and their families, in turn, stop in and support these businesses, sharing it all on social media. To help repay a community that supports their race, organizers opened ten charity slots, race entry slots set aside for teams willing to pay an increased registration fee, with proceeds going to local not-for-profit organizations. “It’s important that we all come together to do what we can for people in need, and this is one event that makes that a priority,” says Henderson. Henderson notes that the race has donated over $67,000 to more than 40 area charities since it began. Organizers also held a drive for local organization Mothers & Others at the Smith Opera House on Saturday, collecting backpacks and handbags filled with donated items.